Soak moong dal for 1 hour. Pressers cook with 2 cup of water for 2 to 3 whistle or till dal cook. Heat oil in pan, add cumin seeds, garlic paste, green chilly, hing, sauté for 10 seconds. Add curry leaves, tomatoes, chopped palak, salt and mix well. Cook for 3 to 4 minutes or till tomatoes soft. Add turmeric powder, red chilly powder, coriander powder, garama masala, mix well. 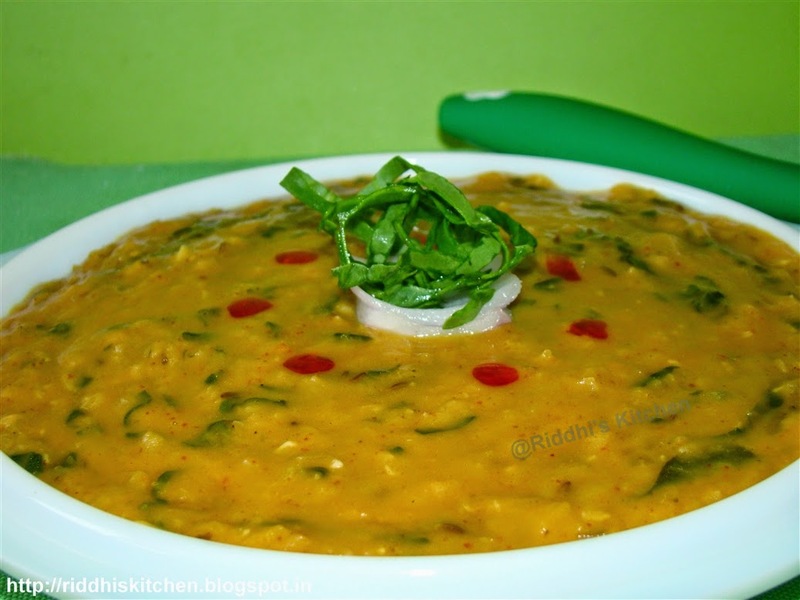 Add cooked dal, if required then add water to adjust consistency of dal. Mix well. Cook for 5 to 6 minutes. Add lemon juice and mix well. Take serving bowl, pour dal. Garnishing with onion rings and shredded spinach/palak. Pour some chilly oil and serve hot.